Cambodia’s Prime Minister Samdech Akka Moha Sena Padei Techo Hun Sen has affirmed that Cambodia will not leave the electoral reform in a stagnant state. 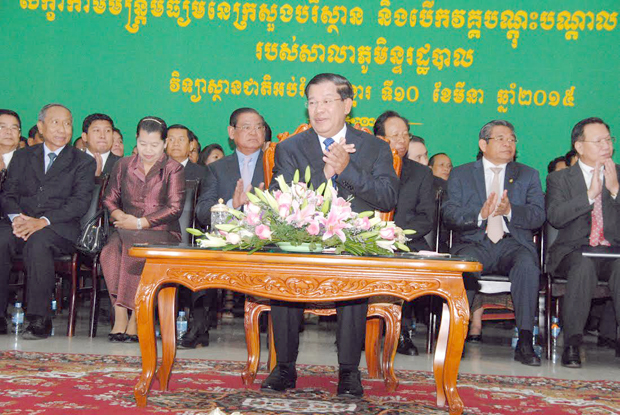 Addressing to a graduation ceremony of the Royal School of Administration held here this morning, Samdech Techo Hun Sen said we cannot leave a country, an institution, a mechanism in a state of stagnation. This reaction was made after some civil society organizations announced to boycott the consultation workshop on the proposed Law on Organization and Functioning of the National Election Committee and the proposed Law on Election of Members of the National Assembly held yesterday. The workshop attracted some 400 participants from different stakeholders, including representatives of the ruling Cambodian People’s Party, the opposition Cambodia National Rescue Party, some foreign embassies, and civil society organizations.